Such a simple concept, and yet so hard to do. But now that I've become a mom, I'm learning to live more in the moment. Tomorrow will always come, yes, but there's no sense worrying about something that hasn't even happened yet. I'd much rather play babies or ball or chase with my daughter. The number of times she giggles is more important than the number of minutes I've wasted in the day. Here's to living in the moment. Happy Monday! 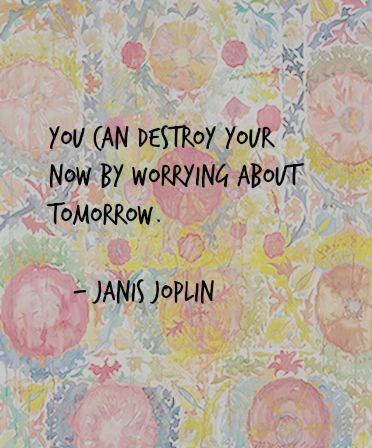 I never read that quote by Janis but it's a great one. Imagine if you will driving on a highway, "the highway of life." You don't want to spend too much time peering far into the distance at the horizon or looking in the rear view mirror. Focus on the road right in front of you and negotiate the curves, bumps and potholes as you come to them. We are going to be feeling the effects of tropical storm Colin today and I wanted to stop by before we lose power. I hope it doesn't come to that. Have a great week, dear friend Ashton! We haven't really had anything tropical since my first year working, and thankfully all we're seeing out of Colin is some much-needed soaking rain. Stay safe and dry, Shady!